Let me start off by saying, as a fan of “Parks and Recreation,” it was delightful seeing Andy Dwyer in space. 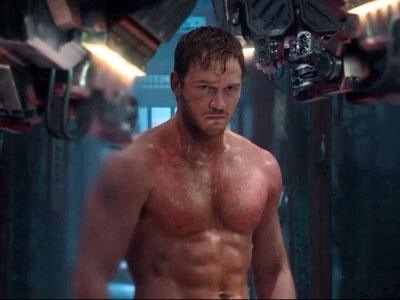 Although there are certainly a good number of goofball moments, Chris Pratt’s performance was a great balance of criminal, hero, dork, and suave muthafucka. His Starlord really rather perfectly captures the qualities of the Everyman. I like this trailer even better because it gives us a bit more on the characters but also gives us more actions scenes. Even though I will admit I was a bit disappointed to not to see more comedic moments with Chris Pratt. At the same time it’s not a comedy but an action movie so it was nice to get an idea of the kind of action that we will be seeing. It was nice to see more from Rocket Raccoon and Groot, this way we can actually get an idea of their personalities. Also loving that the female is the assassin, I am a fan of a deadly female. I know I will be seeing this in theaters when it come out August 1st, who else will be checking the movie out?